With Christmas just a few days away, it looks like the current mild weather is affecting our shopping habits during one of the most important shopping periods of the year. Christmas is a key trading period for suppliers and retailers, and the challenge is to take advantage of the seasonal uplift by making sure the goods we want are available on the shelves. Recent press coverage has reported that Christmas shoppers are benefitting from the deepest high street discounts since 2008 after mild weather and a disappointing Black Friday left shops with stock to clear. Good news for the savvy shopper looking for a bargain, not so great for retailers who need to respond to these challenging conditions. While we might normally expect sales of hats and scarves, sledges and de-icers to be at a peak in December, the reality this year is that they are unlikely to be top of anyone’s shopping list. In fact, the statistics halfway through this month showed that for Wales, southwest England and southeast England it has been the mildest start to December using data back to 1960. Provisional figures mid month show that the UK average maximum daily temperature is 3.2C above what would normally be expected at this point in December. Daily maximum temperatures in the mid-teens Celsius have been recorded, when values would normally be hovering around 6-7C. Predicting demand accurately is a significant challenge for the retail industry. We recently carried out some research among executives and managers in retailers and suppliers and the findings highlighted how much of a challenge demand planning is and what a difference getting it right can make. Suppliers confirmed that improving demand planning accuracy is their number one priority and retailers highlighted better on-shelf availability as a goal. 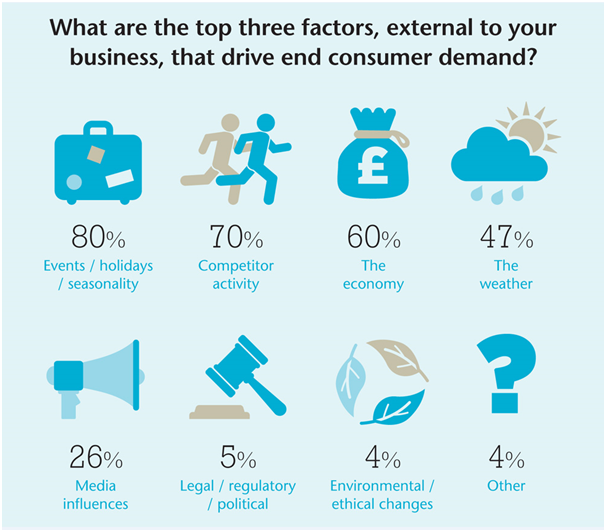 Across both groups, the top factor external to their business that drives consumer demand is seasonal holidays and events. So Christmas puts extra pressure on retailers and suppliers at a time when weather (the fourth external factor they highlighted as affecting consumer demand) can make things even tougher. With the weather forecast for the next few days bringing more mild, wet and windy conditions, it doesn’t seem likely that we’ll be buying our winter woollies just yet. You can find out more about how we help retailers and suppliers with tailored weather forecast services here. Check out our forecast pages to see what weather you can expect in the lead up to Christmas, to see if you’ll need to wear that Christmas jumper and whether you’ll see any snow on the big day. This entry was posted in Met Office News and tagged Christmas, consumers, demand planning, mild weather, retail, sales, suppliers, White Christmas. Bookmark the permalink.